Each May Retro 51’s offices begin to buzz with excitement as the start of the National Stationery Show approaches. Months of hard work are finally realized as new products start to roll in and we can finally put our hands on them. And what a feast for the senses we have this year! New finishes, textures, concepts, and colors abound! Here is a sneak peek of the items that will be making their debut at this year’s Stationery Show in New York on May 20th. Who could make a grander entrance than the King and Queen? This pair of Tornado pens are covered in iconic playing card graphics that we hope will improve your luck, if you keep them at hand that is! We are particularly excited to introduce you to the Vintage Metalsmith series. 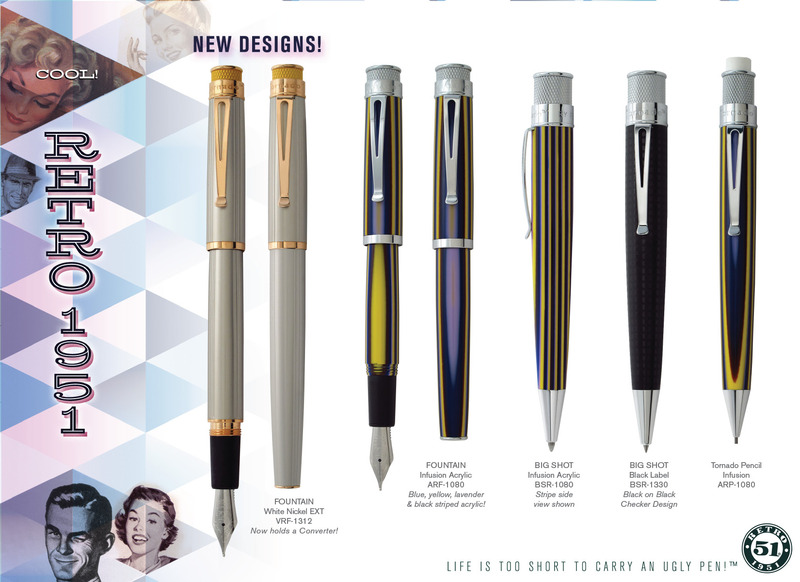 Each pen in this series has a brass barrel that has been finished with a unique process to provide some stunning results! 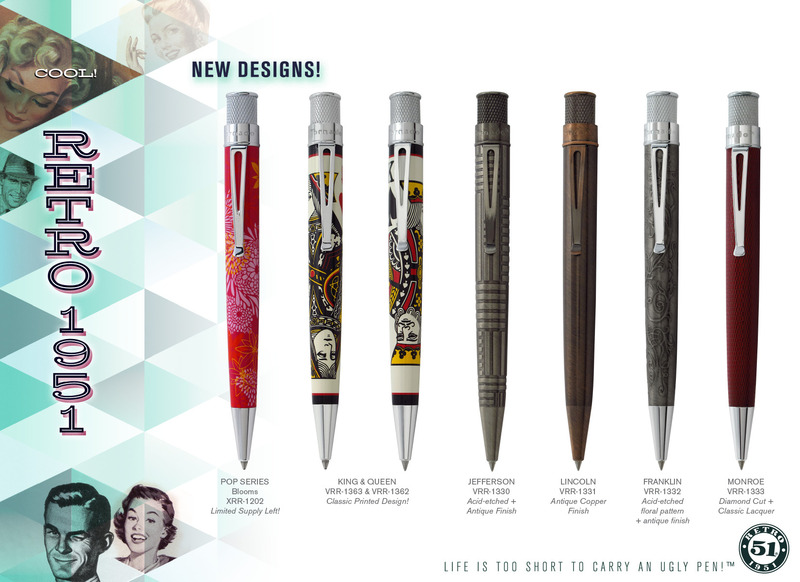 Whether they make you nostalgic for that old pen your grandparents used to carry, or you simply find them intriguing, we think you will love the sensory experience that these pens have to offer. The Jefferson and Franklin have been acid etched to produce distinctive raised designs and then treated to an antique finish. The Lincoln also has an antiqued finish, but in a copper color that is reminiscent of a lucky penny, and finished off with a light lacquer coating for a smooth touch. And finally, the Monroe’s diamond cut barrel is truly a textural wonder with its lacquer overlay that adds a smoothness to the texture that is quite delightful! Be the Big Shot again with our latest designs in this classic Retro series. The Black Label offers yet another new finishing process with its matte black barrel that has been overlaid with contrasting black gloss checkers. The result is not only pleasing to the eye, but gives a smooth yet ever so slightly textured feel that makes for some excellent gripping. As for the new Infusion, acrylics are always a favorite with their bold blend of colors that an acrylic material can offer. And the Infusion does not disappoint in this regard with its mélange of vibrant colors. The Infusion is also available in a 1.15mm Tornado pencil as well as a classic Tornado Fountain Pen! Last but not least and driven by our devoted fountain pen lovers we introduce the Tornado Fountain Pen EXT. Yes, that’s right; EXT means that the barrel has been extended! Our latest Tornado fountain in a classic White Nickel finish (look familiar?) comes loaded with two standard ink cartridges in the barrel and a converter on the side! We think you will enjoy this new spin on a classic. Which one is your favorite? We’d love to hear your opinions! The Lincoln looks cool. I use a stealth tornado right now — the tornado in general by far my favorite everyday pen to use. Just bought a Lincoln at the Dallas pen show. The Tornado is my pen of choice when gify giving. This one is mine! Any thoughts on a coffee bean themed pen for us coffee hounds? Yes we are definitely thinking about it Rob, as there are several coffee lovers here. It’s still early in the design phase though, but stay tuned.